November, like a few other months, has more than one birthstone. Perhaps the reason why is because of their remarkable visual similarity. 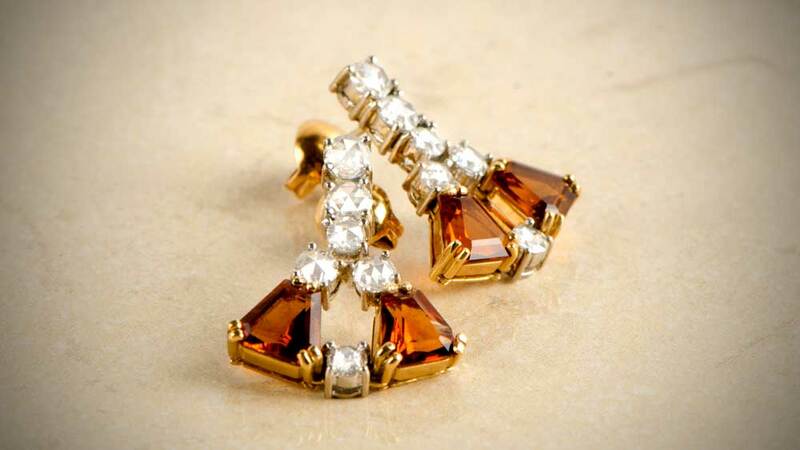 Although topaz occurs in many colors, yellow to brown orange are the most common. This has historically meant confusion with citrine due to the similar range of colors. It is actually only relatively recently that the two have become distinct gemstones with no crossover. 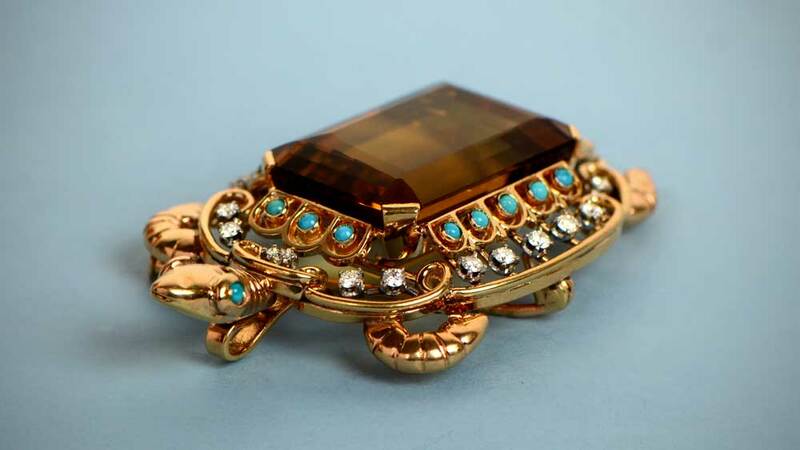 According to the Ancient Greeks, topaz could thwart magic spells. In middle-England, the belief was that it could cure poor vision by placing the stones in wine for 3 days and then rubbing them on the person’s eyes. Citrine, despite its use in jewelry for thousands of years, seems to lack the usual “powers” other gemstones have. Once it became obvious that citrine and topaz were different stones, all the magic seemed to leave with topaz. This hasn’t stopped citrine being hugely popular for both its beauty and value for money. Where Do Topaz And Citrine Come From? Topaz and citrine have both been around for thousands of years. This means many of the original deposits have long since ceased to produce even small quantities of gem quality stones. Today, the best topaz comes from the state of Minas Gerais in Brazil. Topaz of all colors from yellow to purple are common from these deposits. Pakistan produces fine pink topaz, with other deposits in the US, Namibia, Madagascar and across Asia all producing the more common yellow topaz. Citrine started life as yellow topaz. After the realization that the two stones are completely different, it became a gemstone in its own right. Only occurring in a narrow range of colors, the prime deposits are in Central and South America, as well as in Spain and Madagascar. Citrine often occurs alongside amethyst deposits. Occasionally, both occur in the same crystal and has the name ametrine. Topaz is a silicon-based mineral, made up of aluminum and fluorine. With a Hardness on the Mohs Scale of 8, it is one of the hardest minerals on the scale and the hardest silicate. Topaz crystals form within lava flows of igneous rocks and can be hundreds of pounds in weight. Citrine takes its name for the French for lemon, citron. This is largely due to natural citrine being yellow-orange or yellow-brown. Quartz makes up a variety of different gemstones, usually based on the color of the crystal. As well as citrine, amethyst, agate, and onyx are all varieties of the mineral, which is the second most abundant mineral in the earth’s crust. Despite its level of hardness, topaz is actually quite brittle. Weaknesses within the planes along which the atoms of topaz are bonded. With enough impact force, they are liable to fracture or shatter. Different names apply to the different colors of topaz. 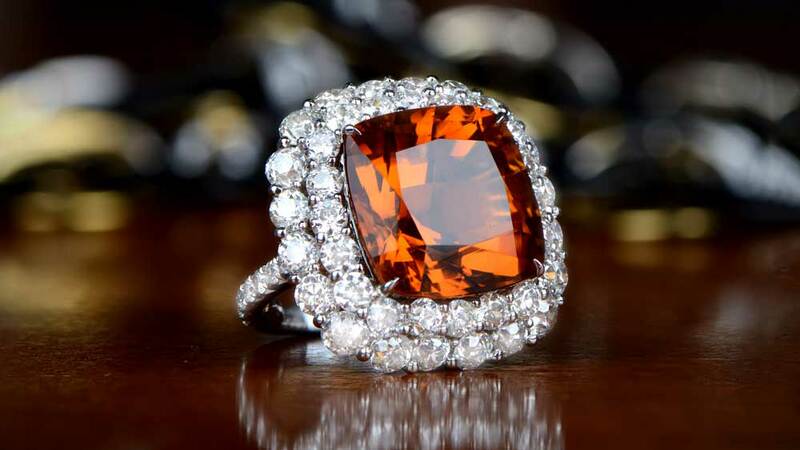 Orange topaz has the name “Precious Topaz”, with other colors having the name “Imperial Topaz”. Blue topaz has its own classification but is very rare. Blue Topaz can be created by heat-treating clear or grey stones. Natural blue topaz can also see an improvement in the depth of color by heat-treating. Topaz actually feels a little slippery to the touch, unlike other gemstones. Natural citrine is usually colorless, with trace elements being the reason behind the yellow color of the stones. However, natural citrine is, in fact, incredibly rare. The vast majority of citrine on the market is actually amethyst that has had heat-treatment. Both are varieties of quartz and often occur in the same deposits. This treatment causes citrine to be available for modest prices, even if the stones are quite large. Blue and colorless topaz are both very affordable and are available in many jewelers. The reason for their lower price is because they have had heat-treatment to create the blue color from other shades. No other topaz has this treatment, and so the value of blue topaz remains low. Imperial topaz or the very rare red or pink topaz carry a significant premium. Because of the wide range of colors, topaz works very well in almost any setting. 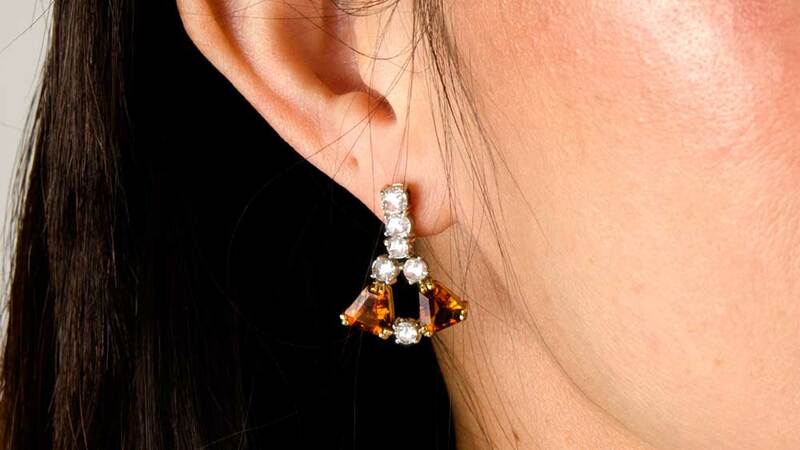 The deeper orange or grown hues also work very well as a contrast to diamonds. Because topaz crystals tend to be larger than most other gemstones, the finished stones reflect this increased size. 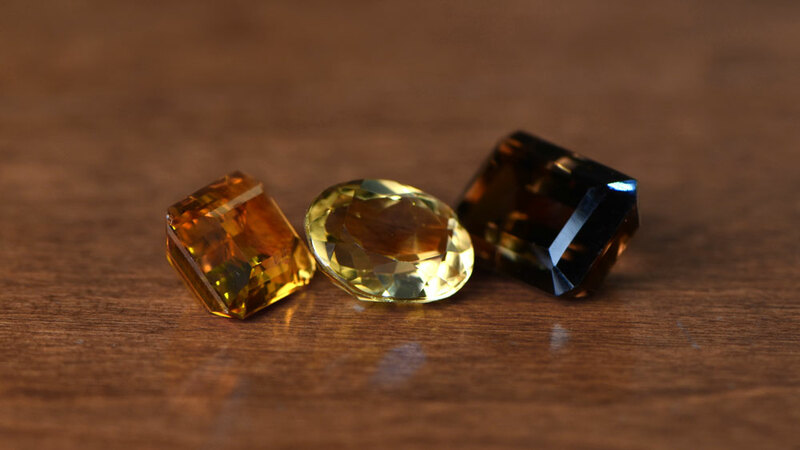 Having a range of colors from yellow to brown means that the variety of tones in citrine are less than for other stones. Most desirable are the deep orange-yellow colors with little or no brown included. Fantasy cuts are common for citrine and often appears as objets d’art or miniature carvings, as well as rings, necklaces, and other jewelry. The relative affordability of both topaz and citrine allows buyers to employ a large degree of flexibility in the stone(s) they buy. Topaz does generally have some inclusions, and there is a trade-off between the rarity and richness of color which determines the value. If the color is rare, then the price rises significantly. Fortunately, the slightly smaller range of colors usually means that stones are available which might not be the perfect color but which are perfectly acceptable. The difference in price of these stones can be surprisingly large. Citrine is almost always “eye-clean”, that is the clarity is reasonably good and consistent across stones. Any that do have inclusions quickly lose their value unless the color is particularly good. Like topaz, the size of citrine crystals allows fantasy cuts and other carvings to be created. Citrine stones up to 20 carats are quite common in jewelers’ collections, so finding the stone for you shouldn’t be difficult. Topaz will not cope well with steam cleaning or ultrasound cleaners. Both are liable to damage the stones, especially if inclusions are present. Although fracture filling is not a treatment common with topaz, the inherent plane weakness often present mean it is prone to splitting. High pressure or the vibrations from ultrasound cleaners could damage the stone badly. Citrine is more resistant to ultrasound cleaning, but steam cleaning should also be avoided. Most citrine has been heat-treated, and the color could be changed with even moderate heat from the steam. As long as you clean your topaz or citrine jewelry regularly, warm water with a couple of drops of mild dish detergent will do the trick. A soft toothbrush can be used to loosen stubborn grease and dirt or to work it out from the nooks and crannies of the setting. Dry with a soft, lint-free cloth, and allow to finish drying naturally.